A major C$4.2 million reclamation programme is under way at De Beers Group’s Victor mine in Canada. It involves the planting of more than 166,000 trees and willow stakes – the first time anyone has undertaken a programme of this kind in the James Bay Lowlands in north-eastern Ontario. Victor mine opened in 2008 and is forecast to exhaust the current pit in early 2019, so reclamation activities and rehabilitation work is already happening in areas no longer required for the current mining area. De Beers Group’s Voorspoed mine in South Africa is scheduled to close in 2020, so reclamation activities are gathering pace there as well, as both mines work with local communities and businesses to leave a positive legacy. 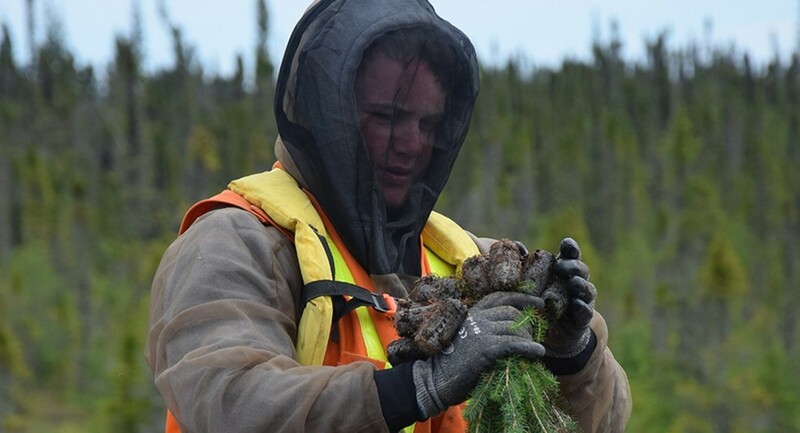 During 2017 alone, 116,000 black spruce seedlings are being planted in areas around the Victor site, plus 50,000 live willow stakes along South Granny Creek - and more are coming this autumn. Around 93,000 native plant seedlings collected by young people from the Attawapiskat First Nation community over the past three years are being grown at an aboriginal-owned nursery in British Columbia for planting in 2018. And 246,000 Black Spruce, Jack Pine and Tamarack tree seedlings are being grown by an Ontario nursery this summer, also for planting next year. Also, as part of the programme, heavy equipment is sculpting land around the mine to its natural contour. Eight young Attawapiskat people started work in July for the fourth year of a successful seed collection programme. The exact number of seeds that will be collected is difficult to determine, but the 36kg of seeds Katherine expects to gather may add up to millions of seeds. “For example, alder seeds can be anywhere between 30,000 and 70,000 seeds per gramme,” she added. All seeds collected are sent to Victor mine where a team cleans, dries, sorts and weighs them in preparation for planting. At Voorspoed, the company has been involved in long-term discussions about the mine’s land end-use. Two opportunities look to be particularly suitable – livestock farming and mixed game ranching. Both have the potential to be at the heart of a future plan for the local area.